Problems connecting Outlook 2003 to Exchange 2010 could turn out to be an unpleasant surprise after migrating to Exchange Server 2010 over the weekend. 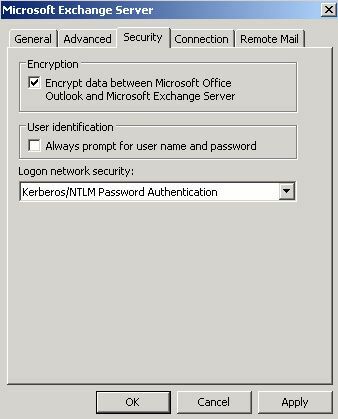 The problem is caused by Outlook 2003 not using encrypted RPC connections to the Exchange Server by default, and Exchange 2010 requiring encrypted RPC connections (contrary to earlier Exchange versions). The solution is simple but you have several options; The way you should proceed not only depends on your situation but you also need to check the company’s security policies regarding communications encryption which might restrict your options. Close everything with OK > Next > Finish > Close > OK.
For a more detaild guide on implementing the Outlook profile change or implementing the GPO using an administrative template, consult KB2006508. Update (13 apr 2011): Rollup 3 for Exchange 2010 SP1 contains UDP support. To enable it, apply RU3 and set HKLM\SYSTEM\CurrentControlSet\Services\MSExchangeRPC\ParametersSystem\EnablePushNotifications to 1 (REG_DWORD). More information in support article kb2009942. New e-mail notifications from Exchange to Outlook, we receive them all the time. Most of us never look at the technique, because in most cases this works so there’s no need. But what if it doesn’t or you are experiencing delays? With Exchange 2010 this situation is more likely to occur than with earlier versions of Exchange, because many people are still using Outlook 2003 or earlier clients. To understand why this happens, you need to understand how these notifications work (or should I say worked). Note: To improve readability, you should read “Outlook 2003 or earlier versions in online mode” when it reads “Outlook 2003” from here on, unless states otherwise. The reason for performing this step on the CAS server is that Exchange 2010 will determine the polling frequency, not the client. The setting will work immediately, but clients need to reconnect in order for the new value to become effective. Note that setting this value lower than 5000 has no effect because Outlook 2003’s minimum poll rate is 5000. Another solution is to enable cached mode for Outlook 2003 clients. This will not solve the delay in receiving new e-mail notifications, but it will solve the most annoying issue, being the delay in visual feedback. In cached mode users won’t notice the delay because they’re working with a local copy of their mailbox. Any changes (sends, deletes, moves) will happen in the local cached file (OST), and Outlook will update their Exchange mailbox in the background. The article fails to mention the third solution: upgrade! The reason Outlook 2007 doesn’t have this issue is that Outlook 2007 (and later) support a third method: asynchronous (push notification). And as you’ve probably guessed, Exchange 2010 (and Exchange 2007) supports this method as well. Today Microsoft released the Microsoft Exchange Online Connector for Outlook 2003 version 1.0. With this connector you can connect to Exchange Online using Outlook 2003 for free/busy lookups and to download the offline address book. Be advised that the connector is not supported on Windows 7 or on any x64 version of Windows. You can download the connector here.